The Italian scientist and inventor Tito Filippo Gonnella (1794–1867), professor of mathematics and mechanics at the Florentine Accademia di Belle Arti di Firenze, is primarily known as the inventor (in 1824) of one of the first planimeters in the world (see the nearby drawing). The planimeter is an instrument for measuring the area, enclosed by an irregular closed curve. An improved version of Gonnella's orthogonal planimeter was exposed at London International Exhibition of 1851 in Crystal Palace and received the highest award for this type of instrument—the Council Medal. Gonnella is known also as the inventor of an improved reflecting telescope (presented in 1841). In the context of this site however, we should pay attention to two other Gonnella's discoveries, namely the two mechanical calculators, devised in 1850s. The two above-mentioned machines are described in Gonnella's 35 pages brochure Descrizione di due macchine aritmetiche per l'addizione e construtte da Tito Gonnella, published in 1859 in Florence. 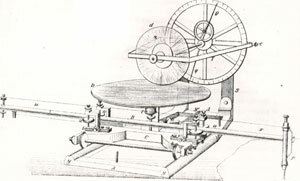 Gonnella was obviously interested in calculating devices for many years, as it can be seen in his earlier brochure Opuscoli mathematici nei quali si tratta, published in 1841 in Florence (most of the work is concerned with a theoretical treatment of optics, but the final section describes an integrating machine—a form of planimeter). First of the devices was a Pascaline-like wheel (dial) adder, similar to several other simple early adders, e. g. that by Jean Lépine and Hillerin de Boistissandeau from 1720s, or that by David Roth from 1840s. Three of these machines have been built in 1857 (one of the devices was gifted to the Leopold II, Grand Duke of Tuscany, who used to finance Gonnella's investigations, other was demonstrated to the Florentine scientific public). It seems only one of the devices survived to our time, and is kept in the collection of Arithmeum Museum in Bonn (see the lower image). The dial adder of Gonnells (see the lower drawing) is a 6-positional (both in the input and result mechanisms) brass and iron device, placed in a wooden box. Its dimensions are: 53 x 10,6 x 10,7 cm, weight: 4,5 kg. The numbers are entered by means of a pen. The tens carry transfer mechanism of the adder is unique and original, but not quite reliable, because in case of ripple carry (for example adding 99999 plus 1) it tends to jam. Gonella acknowledged this flaw and attempted to correct it with an anti-jamming device. 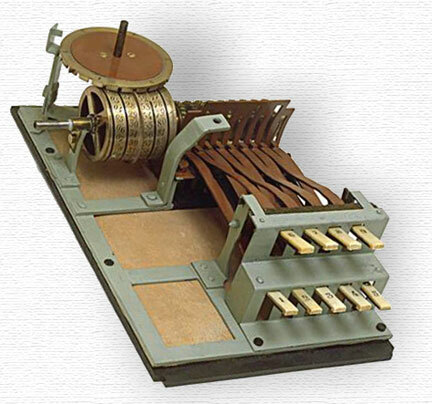 The Gonnella's Keyboard Adder, devised in 1858, is the seventh known for the time being keyboard-driven machine in the world, after machines of White, Torchi (1834), Schwilgué (1844), Parmelee (1850), Schilt (1851) and Hill (1857). 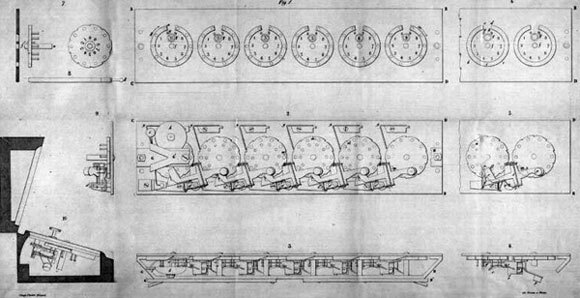 Gonnella certainly was not aware of the machines of the American inventors Parmelee and Hill, but he probably knew the machine of his compatriot Luiggi Torchi, which has been exposed in the Palace of Science and Arts of Brera in 1830s, as well as with the machine of Schwilgué and especially with Schilt's, which has been exposed at the 1851 London International Exhibition (where Gonnella's planimeter was awarded) and received a bronze medal. The Gonnella's Keyboard Adder (see the lower image) is a solid brass-iron device (size 20/30/18 cm, weight bellow 1 kg). The device has a nine digit keyboard (keys 1—5 on the lower row, 6—9 on the upper row). 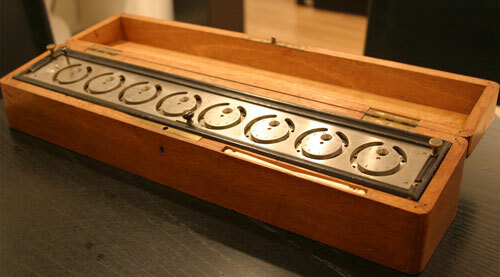 The accumulator is in the form of a helical drum (a drum with engraved helix curve). 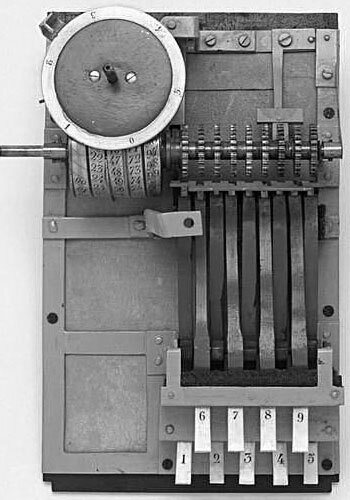 Like other machines of this kind (so called single column adders), it was intended to add a single digit at a time, i.e. the unit column is entered first, then the tens, the hundreds, the thousands, and so on, certainly rather cumbersome task (as every partial sum had to be recorded on paper and the sum eventually performed), which greatly limits the usefulness of such devices. Each of the keys is attached to a toothed sector, the number of teeth of which corresponds on the figure, engraved on the key. The pressing of the keys causes the same upward movement of the corresponding sectors. During this movement the teeth of the sector will engage with one of the nine tooth wheels and will rotate it, as the angle of the rotation is proportional to the number of the teeth, e.g. pressing of the 7-key causes the corresponding wheel to rotate 7/25 of the turn (because the 100-divisions helical flange of the drum is a four-turns, i.e. 25 divisions per turn). The teeth wheels are fixed to a shaft, to which is also attached the drum in the left part, on the surface of which is engraved a four-turns helical flange, graduated with 25 divisions per turn (total of 100, from 0 to 99). Thus the drum rotates simultaneously with the teeth wheels. The helical flange engages with a peripheral slit on the bottom of the horizontal mounted wheel (graduated on the periphery 0 to 5), that rotates 1/25 of the turn every turn of the drum, thus counting the hundreds when 99 is exceeded. This solution allows sums up to 599 to be calculated, not requiring a carry mechanism to be implemented, because the addition sum can be read as a combination between the figure on the horizontal wheel and the figure on the drum. 1. A mechanism for resetting the drum and the horizontal wheel. 2. A spring-driven arm, destined to avoid the recoil of wheels. 3. A five-key keyboard, to be pressed two in sequence for digits greater than 5. In 1861 Gonnella received a medallion at the Tuscany Exhibition in Florence for his calculators. Both Gonnella's adding machines were exhibited several times in Italy in the second half of 19th century.